Lena Dunham is happier being heavier. The "Girls" star and creator, 32, posted a picture of herself from a year ago, when she was 24 pounds lighter, next to a recent pic, in which she said she feels "happy, joyous and free." "On the left: 138 pounds, complimented all day and propositioned by men and on the cover of a tabloid about diets that work. Also, sick in the tissue and in the head and subsisting only on small amounts of sugar, tons of caffeine and a purse pharmacy," she wrote about the photo from April 2017. At the time, Dunham was battling endometriosis and chronic pain and had undergone multiple surgeries. 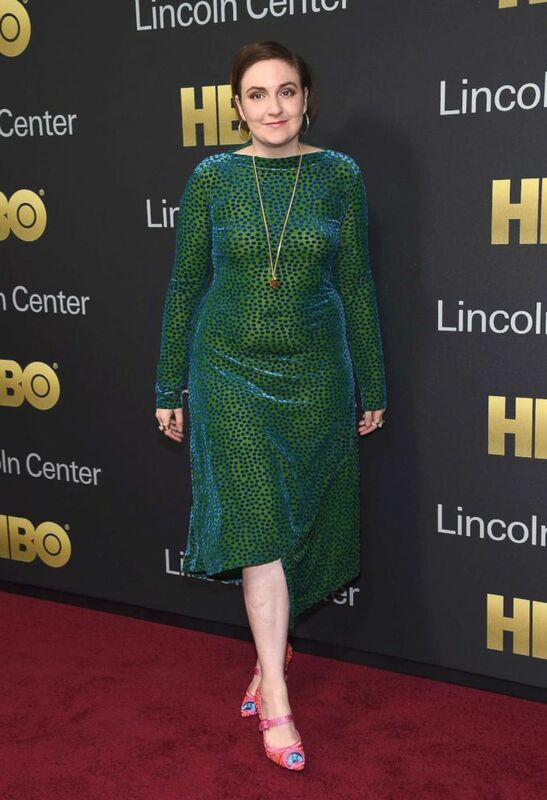 Lena Dunham attends the 2018 Lincoln Center American Songbook gala honoring HBO's Richard Plepler at Alice Tully Hall, Lincoln Center, May 29, 2018, in New York City. "On the right: 162 pounds, happy joyous & free, complimented only by people that matter for reasons that matter, subsisting on a steady flow of fun/healthy snacks and apps and entrees, strong from lifting dogs and spirits," she said about the more recent photo. She continued, "Even this OG body positivity warrior sometimes looks at the left picture longingly, until I remember the impossible pain that brought me there and onto my proverbial knees. As I type I can feel my back fat rolling up under my shoulder blades. I lean in." On the left: 138 pounds, complimented all day and propositioned by men and on the cover of a tabloid about diets that work. Also, sick in the tissue and in the head and subsisting only on small amounts of sugar, tons of caffeine and a purse pharmacy. On the right: 162 pounds, happy joyous & free, complimented only by people that matter for reasons that matter, subsisting on a steady flow of fun/healthy snacks and apps and entrees, strong from lifting dogs and spirits. Even this OG body positivity warrior sometimes looks at the left picture longingly, until I remember the impossible pain that brought me there and onto my proverbial knees. As I type I can feel my back fat rolling up under my shoulder blades. I lean in. Dunham wrote in an essay for Vogue earlier this year that she made the tough decision to have her uterus and cervix removed after a decade of grappling with pain from endometriosis and nine previous surgical procedures.